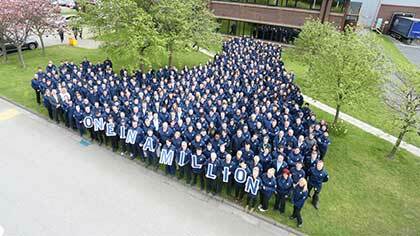 Husqvarna has celebrated a landmark occasion for British manufacturing in April as it marked the production of its one millionth robotic lawnmower at its UK headquarters on Aycliffe Business Park – said to be a first for the industry. The day, which proves a milestone moment for the company, is a testament to Husqvarna Group’s devotion to innovation in lawn mowing, and to the 130,000sqm Aycliffe site which has been a manufacturing force for robotic mowing since 2006. Husqvarna Group is a pioneer in robotic grass cutting technology, and through the success of its range of products and solutions, is the global market leader in robotic lawn mowing. In 1995, the group created the robotic mower market by introducing the Solar Mower, the world’s first-ever robotic mower. Today the Husqvarna Group offers a range of robotic mowers in the Husqvarna, Gardena, McCulloch and Flymo brands. Kai Wärn, CEO and president for Husqvarna, said: “Celebrating 1,000,000 environmentally friendly robotic mowers is a milestone for the Group. More than 20 years ago, we created the robotic mower market and have developed the market ever since. “We naturally have a strong market leadership within this category while many of our competitors still are fairly new in the market. Production of robotic mowers has been ongoing for 22 years and in 2006 its Aycliffe factory began the manufacturing of its flagship product. In the height of the season it can see around 3,000 models produced per day. It takes, on average, input from 72 staff to produce each robotic mower and the factory currently employs 1,154 people to produce machines which are exported worldwide. The main market for robotic mowers is still Western Europe but is growing globally by at least 20% each year.